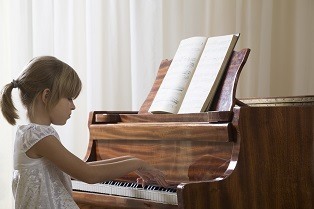 So you’ve just started your piano lessons and would like a general estimate on how long it will take to learn to play the piano “fluently.” Or maybe you’re thinking of short-circuiting the typical amount of time required by finding a good teacher or course. In each case, the time you will need depends on factors like age, the style you want to master and the amount of time and dedication you can allocate to your piano lessons and practice sessions on a daily basis. The good news is, anyone can learn how to play the piano at a good level, whether they be a 9 year-old child or a 55 year-old adult. Of course the first step in learning how to play the piano is finding the right tools. A grand piano or electronic keyboard are the best instruments for the job. You can also consider learning the basics on an electronic tablet with the help of a professionally designed piano app. The traditional way is to get a professional piano teacher and practicing under his/her guidance every week. Music books can help you learn the basic of musical notation, as well as the notes, tones and all other concepts you have to master before becoming a piano wizard. In theory, you can learn on your own just by studying from books and practicing, however, that can be a much more challenging endeavor. YouTube and other online video websites have extensive videos published by piano experts that outline the basic rules and principles associated with playing the piano. Additionally, you can consider the convenience and ease of taking online piano lessons. Not only are they easier to follow and more flexible, but they can also be less expensive than having your piano teacher visit your home a couple of times every week. So how long does it take to learn how to play the piano through each of these different methods. Opinions vary, however, with the help of a good teacher or a well-designed online course, the time involved is much shorter. Typically, an adult can learn to play decently by practicing each day for 4 hours over a period of 10 to 15 years. However, factors such as talent, the style you want to learn and the specific pieces you are more interested in paying will all factor in to alter that time considerably. Music books have all the knowledge you need. You can use them to learn about music, notation and the position of your hand on the keyboard. You can also find sheet music you can practice with and special exercises that will train your hand’s reflexes so you can learn piano faster. However, without a teacher to explain everything, a music book is not a resource that will take you to piano mastery in no time. In fact, learning solely from music books often takes years, and requires a lot more dedication and practice than any of the other available methods. YouTube is a free online visual resource for learning many skills, including playing the piano. Basic piano lessons are easy to grasp from YouTube, and the teachers who prepared these lessons have already read all the books and mastered the basics, so you don’t have to. While YouTube can lead you on a free and much faster path to learning how to play, it still comes with drawbacks. There is no interaction between student and teacher, and if you have questions you might need to wait days or even weeks for a teacher to respond to your comments. Also, the lessons don’t account for the specific challenges you may run into (that others typically don’t), so you’re still on your own in many respects. Finally, an online piano course is just the thing. It allows you to gain all the benefits of music books and online video lessons, but in a more personalized, friendly and encouraging manner. Online teachers can often sync their schedules to your convenience, so you don’t have to finish your work early or skip chores to avoid missing out on your lesson. Also, many courses are flexible and personalized to your own progress. If you have difficulty with a certain technique or step, your online teacher will often help you improvise, and suggest alternative exercises that will help you get over your challenges more easily.